The detection of physical forces is one of the most complex challenges facing science. Although Newton solved the problem of gravity long ago, imaging the physical forces that act within living cells remains one of the main mysteries of current biology. Considered to play a decisive role in many biological processes, the chemical tools to visualize the physical forces in action do not exist. But today, researchers from the University of Geneva (UNIGE) and the National Centre of Competence in Research (NCCR) in Chemical Biology, Switzerland, have developed probes that can enter into cells and image live physical forces. These results, a turning point in the study of life sciences, can be found in the Journal of the American Chemical Society. Since its creation in 2010, one of the central objectives of the NCCR Chemical Biology has been to solve the problem of detecting cellular physical forces. "Our approach to creating tension probes was inspired by the color change of shrimp, crabs or lobsters during cooking," says Stefan Matile, professor in the Department of Organic Chemistry at the Faculty of Science of the UNIGE and member of the NCCR. 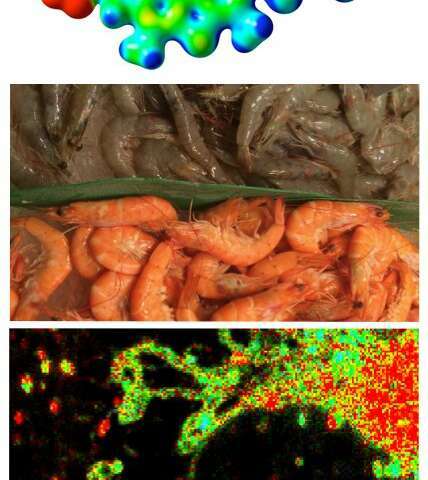 In live shrimp, the physical forces of the surrounding proteins flatten and polarize the carotenoid pigment, called astaxanthin, until it turns blue. "During cooking, these proteins are unfolded and the lobster pigment can regain its natural dark orange color," continues the Geneva chemist. Intrigued by these crustaceans, the development of fluorescent probes operating on the same principle of planarization and polarization required about eight years of research. Last year, the NCCR teams finally produced the first fluorescent probe capable of imaging the forces acting on the outer membrane, called the plasma membrane, of living cells. Requests for samples from more than 50 laboratories around the world came in immediate response to the release of these results, demonstrating the importance of this breakthrough for life sciences. To meet this demand, UNIGE's force probes were launched under the Flipper-TR brand at the end of last year. The study of forces that apply outside the cells is not limited to chemical tools for fluorescence imaging. Cellular surfaces are accessible to physical tools like micropipettes, optical clamps, cantilevers of atomic force microscopes, etc. "But these physical tools are obviously not applicable to the study of forces within cells," says Aurélien Roux, a professor in the Department of Biochemistry at the Faculty of Science of the UNIGE. "Organelles such as mitochondria, responsible for energy production; the endoplasmic reticulum, responsible for protein synthesis; endosomes, responsible for trafficking material to and within cells; or the nucleus, which stores genetic information, are simply beyond the reach of physical tools from outside." Until today, visualization of the forces that operate and control these organelles inside the cells was still impossible, although essential to understand their function. This fundamental challenge in the life sciences is now being met. The NCCR team, led by Stefan Matile, Aurélien Roux and Suliana Manley, professor at the EPFL Institute of Physics, also member of the NCCR, transported their force probes into the cells and selectively marked cellular organelles. They are now able to show, for example, how tension rises in mitochondria that are beginning to divide. "For the very first time, physical forces can be imaged live inside the cells," says Aurélien Roux. This new chemistry tool finally allows scientists to achieve what they have wanted to do for a very long time. "These new probes now offer us the opportunity to tackle mechanobiology and revolutionize the study of life sciences," says Stefan Matile.